Join the discussion on our forums! Come discuss Fluffy Tracker over in our dedicated Fluffy Tracker discussion topic. “Shoot them in the face” is more of a tactic than a strategy. Hopefully we will see a 2 drop weapon to go alongside this, Candleshot alone is not enough. Stat line isn't the greatest, Cave Hydra sees no play and that has a beast tag. I also think there's a good chance to 'wiff" on the discover effect, most of Hunter's spells are either very situational or just plain useless. Meh card. Pretty nice card. I hope we get a cool weapon to go with it. Hunter doesn't have enough weapons (Warrior/Paladin/Rouge/Shaman have more weapons). Currently the only weapons I see are Candleshot and Eaglehorn Bow. I would rather play stronger minion than have a chance to trigger this battlecry. There is a lot of anti-weapon tech available, and against hunter you use it whenever you can get value. Why are you comparing discover with RNG draw? This card's is a fair card - you're probably going to get something pretty useful off the discover if it triggers, but the mana cost is just not working for me, nor is the lack of a creature type (are you really going to play this in a deck where you probably want a full of beasts?). 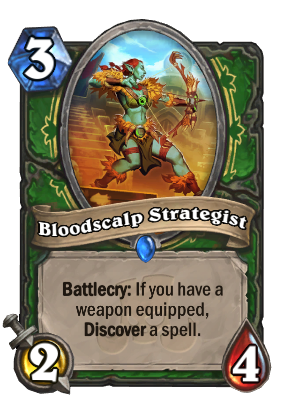 If this were 4 mana, I think it would be a lot better, as it would curve into more options from Hunter's current weapon pool, namely - both Candleshot and Eaglehorn Bow instead of just Candleshot, as this card is a very bad turn 4 play with only 1-mana left open. I'm not sure where this card wants to fit though. In hunter, you got spells-only decks, beast decks and deathrattle decks, and this card fits into none of them. It wouldn't even fit into a hypothetical hunter face deck either. So, it might have a place in Secret Hunter - that deck has only two playable 3-drops - but that's all I see besides being an arena card as it's power level is not really high. Both Eaglehorn and Animal Companion are better 3-drops. How can a card be better if it costs more?